When I first started writing fiction for teens in the 1980s, I came maddeningly close to selling a manuscript to a major publisher. But, alas, the editor sent it back after multiple revisions with advice to offer more hope to readers. Since then, I’ve read a lot of “how-to” books and signed up for a number of workshops that emphasize the hopeful ending in YA fiction. In fact, many literary critics consider a hopeful ending to be one of the elements that distinguish YA novels from adult novels that feature teenage protagonists. Realistic literary fiction, it is said, should present the world in all its unfairness, cruelty, and despair, but one does not want to leave youngsters with such a bleak view. Nor in YA novels should an evil character win out in the end; crime, in other words, should never pay. In reality, crime often does pay. Powerful, evil forces win, and the righteous are crushed. I think one of the reasons so many adult readers are drawn to YA literature, though, is the emphasis on hope. We want fairy tales, stories of good people overcoming almost insurmountable obstacles and becoming even better people in the process. In many ways, this is a good thing. It means we care about, and empathize with, good people. We want to be like them. When we seek uplifting stories, we imagine a better world and, perhaps, ways our actions can bring about that world. Yes, portrayals of despair and evil’s triumph can lead to our greater awareness of the world’s harshness and our determination to fix it. But it can lead just as easily to cynicism or resignation. I thought about these issues when I read Phillippe Diederich’s new novel Playing for the Devil’s Fire last week. 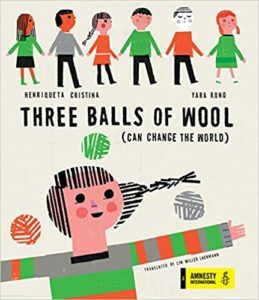 Cinco Puntos Press published the book as young adult, but like many small press books, it doesn’t fit the formula. Set in a contemporary Mexican village, it follows 12-year-old Liberio “Boli” Flores, the son of the town baker (hence his nickname) who sees violence coming to the village along with a new highway. While the drug trade is part of the violence, it isn’t the only thing. Money is the root of evil, and many of the newcomers want to drive out small local businesses to establish outposts of larger chains, part of a predatory global economy. The new money — much more than anyone has ever seen — buys police, politicians, and priests alike. Those who resist are killed in the most brutal ways — or they disappear altogether, leaving their families no closure. This is what happens to Boli’s family. Diederich plays with the battle of good vs. evil in his evoking of Lucha Libre, the stylized wrestling between good characters (El Santo, El Hijo del Santo) and powerful and cruel adversaries. In Lucha Libre, as in fairy tales, good always wins. But Boli loses his innocence at age 12 when he sees that life doesn’t follow the script. 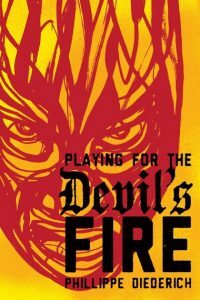 Teenagers who read Playing for the Devil’s Fire will lose a bit of their innocence as well — or maybe if they have experienced unfairness in their own lives, they will realize that they are not alone. 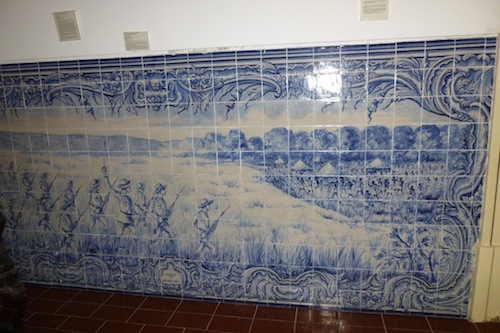 This azulejo at the Military Museum in Lisbon depicts the Portuguese invasion of an African village, with the European faces detailed and the Africans a blur. Another case where evil won. One of the reasons this book resonated with me is that the process of dispossession depicted in the novel is the story of so many people throughout history. Villages overrun by colonial invaders, small farmers trampled by nobles and their knights in the Middle Ages, people forced into debt by the big banks and then repossessed are examples of relatively powerless individuals stripped of everything they had once the powerful decided they wanted it. It’s part of the history of my family in THE HOUSE OF SILENCE — tilling their plot of Portuguese soil until they lost it to the nobles and became landless farm laborers or moved to the city in search of a better life. It’s why my protagonist’s younger brother turns to Communism during the right-wing Salazar dictatorship, as he’s no longer willing to accept that suffering in this life brings paradise in the next. And it’s the common cause he and other characters find with the people of Angola, Mozambique, and other colonies fighting for their independence during that time. My VCFA classmate and friend Sandra Nickel addresses the conflict between good and evil in books for children and teens in a two-part series on the antagonist, taken from her workshop at the SCBWI Summer Conference earlier this month. (You can read these thorough and informative explanations here and here.) Not all antagonists are villains, but she also points out the need for the villain or antagonist to be strong enough that the protagonist’s triumph is genuinely in doubt. That said, there’s a place, even in books for young readers, in which the villain or antagonist wins, if only to show that that the protagonist’s triumph truly can be in doubt. After all, if we knew at every beginning of every book that the good guy would win for sure, would we keep reading? Sometimes, it’s enough that the protagonist lives to fight another day. Update: An 11-day blog tour featuring Playing for the Devil’s Fire will begin on Wednesday, August 31. The first stop is Rich in Color, followed, on Thursday, September 1, with my interview of Phillippe Diederich for The Pirate Tree. And for another perspective, check out Beverly Slapin’s review for De Colores and the comments that discuss the book in the context of the global refugee crisis. Lynn, the book I have coming out in a few weeks (DON’T YOU TRUST ME?) has a psychopathic teen narrator. True, my protagonist (she’s hardly a heroine) is caught in the end, but it is quite clear that she is learning from her mistakes and is going to do it all over again, only better, in the future. I think we have to tell the truth in books for teens. An early reader of DON”T YOU TRUST ME? suggested that perhaps my character could grow and evolve, learning the value of connection and love. I said, “Uh, uh. Sorry. That does not happen with people who have this particular personality disorder. As they grow old, they tend to become less criminally inclined, just because they get tired. They do not learn empathy. One of the dreadful things about being in a relationship with a psychopath is how easy it is to get sucked in, over and over, to believing that they can change. They won’t, and it is important to make that fact clear. If you think about it, one of the classic stories for teens has been THE STORY OF ANNE FRANK. No easy feel-good ending there. Evil wins, because evil does win sometimes. The Diary of Anne Frank was my daughter’s favorite book in middle school. There are other YA books as well where an evil or cruel protagonist learns nothing and continues to make excuses for his/her behavior. Chris Lynch’s Inexcusable comes to mind. One of my most memorable adult reads back in the 1990s (obviously, because I still remember it) was a book set in our neck of the woods, Donald Westlake’s The Ax, where he enticed the reader to sympathize with a laid-off middle manager who murdered all the competitors (it was a small field, kind of like publishing) for a new job. I’m looking forward to your new book! Would you be interested in writing a guest post? Sure, Lynn. Happy to. Have you got a subject in mind? This one, of course (Evil Wins), immediately appealed to me because I thought about it a lot, writing DON’T YOU TRUST ME? Would you like to build on that topic of “Evil Wins.” In Playing for the Devil’s Fire, the protagonist (like Anne Frank) is a victim. In yours, as in Lynch’s and Westlake’s novels, she’s a perpetrator. Okay! What is the usual word count, or don’t you care? Any due date? Most of the pieces here are between 500-1000 words, and I’m flexible on the due dates. Whatever works best for you and the book, because I don’t do a lot of guest posts (though I’m looking to do more). Would you like to have a giveaway? Yes, I can give away a hardcover or ARC. My pub date keeps changing. At the moment it seems to be August 31. ‘Sometimes, it’s enough that the protagonist lives to fight another day.’ This is the long journey that many face–that most of us face?–whether the fight is against inner demons or external demons that range from flawed parents to pure evil. Well said, Lyn! Thank you, Sandra! And thank you again for letting us read your inspiring presentation! Very compelling post, Lyn. Patrice’s book also sounds very compelling. Thank you, Linda! I’m looking forward to Patrice’s book and to her guest post.